How do you prepare little children to get ready for a race of their own? A few months ago, I started training for a half marathon. Of course, I couldn’t just leave my children at home alone, so they were blessed to come with me on a few training runs. I started training at the rec center indoor track, but the kids were soon bored sitting in the stroller going around in circles (I don’t blame them). At one point, I let them out for a little so they could run around, and was surprised at how fast PJ could go. Not only was he running fast, but he was enjoying it! However, I soon stopped using the indoor track once PJ discovered he could scream and hear his echo. PJ wanted to keep running with me. As we would go running together, I started thinking there might be a race he could runl. 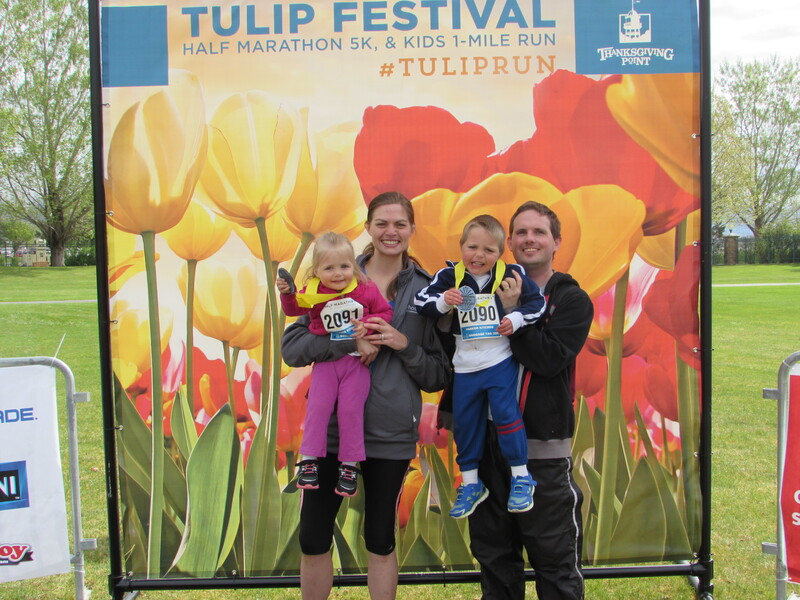 I did some research, and found a one-mile fun run as part of the Thanksgiving Point Tulip Festival that awarded medals to all the finishers. I asked PJ if he would like to run his own race, to which he replied yes. 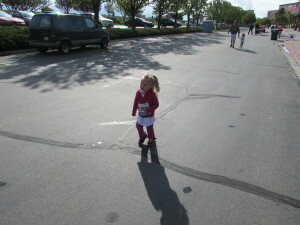 AJ, not wanting to be left out, said that she wanted to race too. 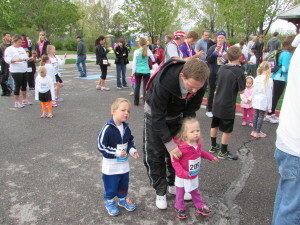 So, while also doing my training runs, I was now going to be helping my children get ready for a race of their own. I had no idea where to begin. How do you “train” a child for a race? I had to keep reminding myself that this was a “fun run.” It didn’t matter how slow or fast they were as long as they had fun. It turned out to be a great way to help PJ get some energy out. One morning, he was literally bouncing off the walls. I suggested we get on some shoes and head to the track. Once we got in the vicinity, I told him he was free to go. He ran all the way to the track and at least 3/4 of one lap before finally slowing down enough to walk. The day of the race came, and the forecast was cold and rainy. We had bought some running clothes for the kids we had been practicing in, but I wasn’t going to put them in running shorts when the temperature was in the 40s. So we put them in their over-sized race shirts and some sweats/stretchy pants that I thought would allow them to move the best. After putting on jackets and making sure they would be warm enough, we were on our way! The starting point was packed. Thanksgiving Point also had a half-marathon and 5K going on at that same time, with the fun run being the last race to start. Josh had to drop me and the kids off so he could go find a place to park. I tried pinning the numbers on the kids while we waited for Josh. He soon found us and we were able to get the time chips on the kids’ shoes. We waited anxiously for the race to start, trying to keep the kids entertained and realize how much fun this was going to be! PJ and AJ followed me in doing some of his versions of squats or walk out planks so we could “warm-up”. We decided that Josh was going to run with PJ. I had no problem running with AJ – I had just finished an 11-mile training run and was more than happy to go at a slower pace! The gun started, and PJ took off with Josh close behind him. AJ and I were in the very back. I kept talking to her, pointing out things like the princesses who were cheering us on. We passed by beautiful flowers and were doing great – until we got to the water station. We had caught up with PJ who was drinking water like he was going to run out. AJ had also stopped and had guzzled down at least two glasses before I convinced her we had to keep going There were a couple times she tripped, but didn’t fall down since she was holding my hand. The course continued through more garden areas and into Thanksgiving Point’s farm. I kept pointing out some of the animals, like the cows and the horses. However, she of course wanted to stop and look at them. I don’t know how, but I convinced her we needed to keep going. AJ kept running as long as I held on to her hand. We came around a little bend and saw the finish line and the crowd. I kept saying “Come on AJ! We’re almost done!” Everyone in the crowd started cheering for this tiny girl who was near the finish line. The announcer was helping cheer people on, and it was surprising (and sweet) to hear him mention her by name. We saw Josh and PJ waiting for us, and soon crossed the finish line to be reunited as a family. I was excited to hear how well PJ had done. Other than stopping for his water break, he had ran the entire way. Actually, he was upset that Josh had run by him because he had wanted to run all by himself! He too had fallen down, but got right back up and kept going. My little boy had just run a mile in 14 minutes and 18 seconds. AJ was, naturally, a little slower with a time of 17 minutes and 33 seconds. 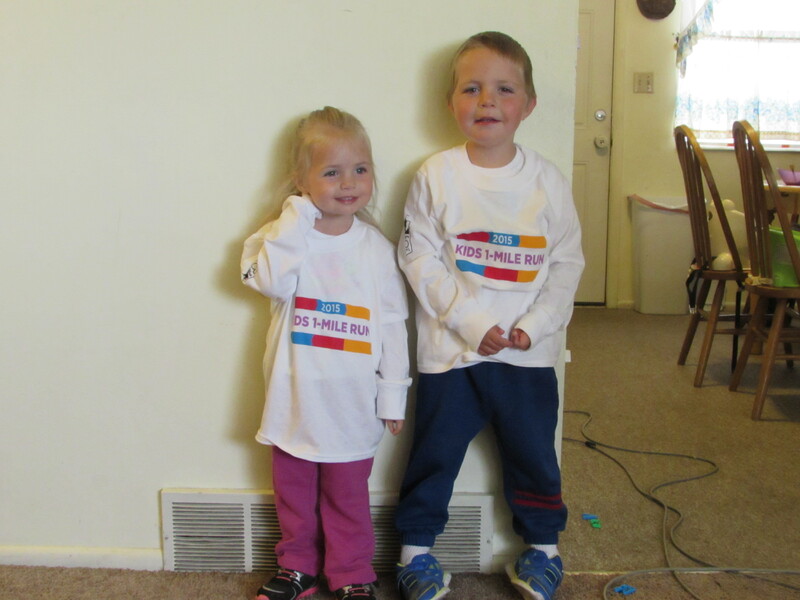 However, both kids said that they had fun and were happy to show off their medals.. We soon left the finish line so they could have the refreshments that they had for the runners – such as bananas, chocolate chip cookies, and milk. Both children were happy to sit down and eat their snacks. We got some pictures taken and then left – just as it started to rain! The kids were so excited that they had run their race! We called their grandparents to let them know how well they had done. Their grandpa was particularly interested, being a former college track star himself. We also took them out for frozen yogurt as a treat. They were told they could pick whatever flavor they wanted, but they would have to eat it all gone. However, they chose flavors based on their favorite colors, not taste. PJ was lucky enough to choose mint chocolate chip (green), but AJ’s choice of cotton candy (pink) was not so desirable. It took almost as long for AJ to eat her yogurt as it did to run her mile! 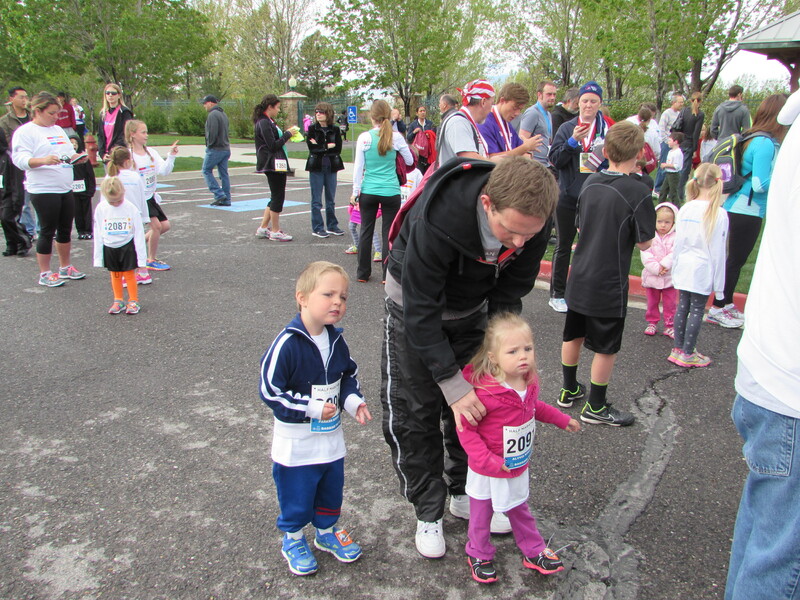 I’ve thought about doing other races with the kids, but only if they agree to it. I don’t want to force anything on them. I want to encourage them to find active things they enjoy. After all, the emphasis was on “fun”!